Our Excite! Cheer staff is comprised of previous NCA and UCA staff members, Worlds, Collegiate, All-star, and high school champions both as participants and coaches, and nationally renowned choreographers. Instruction from Excite! can range from teaching technique and proper skill progressions ot school spirit and personalized choreography. Our staff knows the game day and competition settings inside and out, and would like to help your program prepare for whatever you desire. Schools that have chosen to Excite! 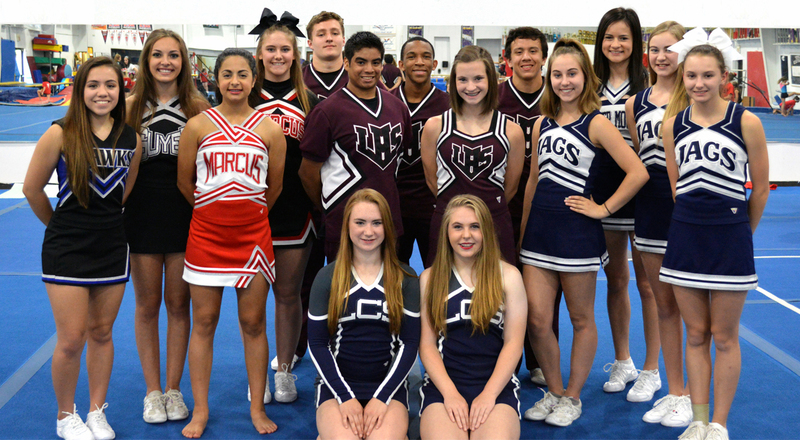 their crowds: Lewisville HS, Marcus HS, Flower Mound HS, Lake Dallas HS, South Lake Carroll HS, Hebron HS, Denton HS, Forest Hill MS, Coppell MS, Liberty Christian, and Lantana Recreation Cheerleading Program. The Excite! staff can help you get prepared in all areas for camp. We will work with your team to set entrances, incorporation formations, stunt groups, and choreography. Our staff can work with you weekly, biweekly, or monthly prior to your camp. The Excite! staff will help train your cheerleading squad(s) on stunts, pyramids, baskets, tumbling, jumps and/or motions. We can work on weekly or monthly sessions depending on your program needs. **Training can take place on location or at Excite! this includes one coach per team each practices. **This option does not include working with Excite! staff, only gym space. Excite! can help your team with whatever pep rally choreography needs your team(s) have. You will receive an original, creative routine from world renowned choreographers. Call Excite! directly for Competition Routine pricing.